Whether or not you’re joining us in Oxford for the Women & Power conference next week, I hope you’ll check out the National Trust’s Women & Power podcast series. The five-episode series is presented by Kirsty Wark, and features a whole host of great stories from across the Trust, and contributions from lots of different historians. I pop up in all five episodes, talking about Victorian Manchester and the Contagious Diseases Acts (Episode 1), force-feeding (Episode 2), Octavia Hill, violence in Oxford, and the NUWSS pilgrimage (Episode 3, with genuine piano underscoring), the suffragettes as terrorists and the myth of why women really got the vote (Episode 4), and the Six Point Group (Episode 5). The series is ace, with brilliant on-location sequences at beautiful Wightwick, Killerton, and Osterley (plus some very energetic Incidental Radio Acting), and I haven’t given it the blog love it deserves. It’s been a lovely soundtrack to writing my keynote for next week’s conference at St Hugh’s, here in Oxford. I look forward to seeing some of you soon. P.S. the book of the Women & Power project, with all the info from the series and more, plus pictures, is still available online. You can also check out my episode of Radio 3’s The Essay on Shakespeare and suffrage, and my 2018 podcast episode on suffragette Emily Wilding Davidson and Oxford’s suffrage histories for Women In Oxford’s History. There’s yet more about Shakespeare and the suffragettes in my first book, Shakespeare’s Women and the Fin de Siecle. A trove. I’m delighted to be giving a keynote talk at the conference Women and Power: Redressing the Balance, which runs 6–7 March at St Hugh’s College, University of Oxford. Jointly convened by the National Trust and Oxford, the title responds to the National Public Programme ‘Women and Power’ which the Trust ran in 2018. I’ll be talking about my work with the Trust, researching stories of (pro- and anti-)suffrage and feminist activity in approx 108 Trust places in England, Wales, and Northern Ireland, and writing the book Women and Power: The Struggle for Suffrage alongside Rachael Lennon. Excitingly, said book is now a finalist at the ACE Awards for Best Guidebook with a turnover of over £1,000,000! I fear this may be the only time in my writing career that “turnover of over £1,000,000” is associated with my name. Do check out the other finalists across the categories – sadly, the judges are actual experts and not a Strictly-style phone-in, or I would be going absolutely mad for Suffraduck (Best Product, fighting off competition from Lady Macbeth’s Hand Sanitizer and a RAF tshirt) and the RAF teddy (Best Toy, vs. Build Your Own Lifeboat and a gargoyle). To download the programme, click here. Any questions, please get in touch below. A few weeks ago I had great fun recording an episode of the Women In Oxford’s History podcast on the suffragette Emily Wilding Davison, and the suffrage movement in Oxford. It’s a story of torchlit processions, Woodstock Road drawing rooms, police brutality, and terrorism. Wilding Davison is best known as the suffragette who died after stepping in front of King George V’s horse at the 1913 Derby. This podcast was a chance to tell the story of Emily’s life, rather than her death, and how the struggle for suffrage disrupted Oxford’s dreaming spires. Suffragists reach Oxford during the 1913 ‘pilgrimage’ from Carlisle to London. 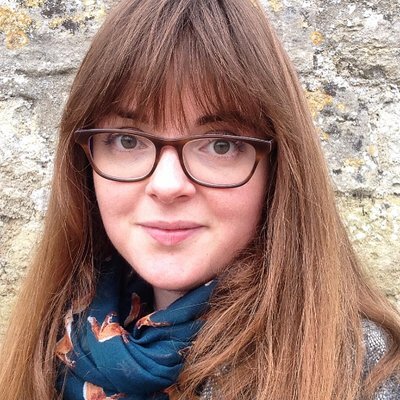 The Women in Oxford’s History podcast explores women’s contributions to the life and history of the city: Wilding Davison was a finalist (and Chaucer fangirl) at St Hugh’s College. St Hugh’s was founded – as we discussed – as an affordable alternative to Somerville and Lady Margaret Hall for the first generation of women university students. Fun fact: Whittard’s on the High Street was once a W.S.P.U. suffrage shop! The episode is available via iTunes and SoundCloud, and a blog post accompanying the episode is here (bereavement! bluestockings! Middlemarch!). My thanks to producers Alice Parkin and Bethany White for having me on the programme. I’m delighted to announce that the book Women and Power: The Struggle for Suffrage has been published by the National Trust. It’s available at a National Trust property near you, via The History Press/Amazon, and via the National Trust catalogue. I co-wrote the book with the brilliant Rachael Lennon. Our foreword was by Laura Bates, founder of the Everyday Sexism project. The book is based on research I did as academic lead on the Trust’s Women and Power project for 2018. Celebrating a year of ‘Women & Power’ programmes throughout the Trust, this book explores the roles of National Trust places in the women’s suffrage movement, through the people who lived and worked in them – from the Midlands kitchen-maid turned suffragette arsonist to the aristocratic dynasties split by a daughter’s campaigning. As well as offering a broad history of the Suffrage movement, readers will discover some of the debates heard in the drawing rooms, kitchens and bedrooms of National Trust places as the country fought over whether, and how, a woman might have a voice in public life. We continue to see the footprints of this intensely political argument in the places and collections cared for by the Trust across England, Wales and Northern Ireland. Working on this book was a joy, and the end result is – thanks to the Trust’s art researchers, and our great editor, Claire Masset – a beautiful thing. Read the book? Visited a National Trust property alongside it? Thrilled or outraged about the amount of suffrage and feminist history on display? Let me know. I spent some of this evening in Headington, helping to pack shoeboxes for Project Shoebox Oxford. This brilliant initiative assembles donated toiletries, cosmetics, small gifts and confectionery into decorated shoeboxes to be given to people in need. I went along in the expectation I’d be packing gifts for women in domestic violence shelters, but in fact there were also boxes for men, children, and babies. Most of the boxes go to Oxfordshire Domestic Abuse Services, but the shoebox gifts also help Simon House, the Gatehouse, and Asylum Welcome, the subject of an earlier Advent post. Simon House is a 52-bed, mixed-gender hostel for local rough sleepers and the vulnerably housed – which is due to be ‘decommissioned’ in April 2018, because, hey, it’s not like homelessness is getting worse every night in the city centre, or anything. The Gatehouse is perhaps Oxford’s best-known homeless initiative; a drop-in cafe for homeless people over the age of 25, at St Giles’ Hall on the Woodstock Road. Volunteer packers are given a list and then go ‘shopping’ through the huge numbers of donations for the essentials, which (from memory) include toothbrush and toothpaste, shampoo and conditioner, face wash, flannel, soap, lotion, comb and hairbrush, sanitary products, hair products, cosmetics and makeup remover, and sweets [ETA: after writing this, I found there were guidelines here]. Those covered, you fill up the box with treats and whatever you think would surprise and please the recipient. Finally, you write and enclose a Christmas card, seal your box with an elastic band, and label it. At this point, I was obsessed. What really charmed me was the excellent quality of most of the donations. Of course, value or own-brand products are all many people can afford to give, and everything helps, but it was really exciting to put together an amazing box with treats from e.g. Kiehl’s or Clarins for a woman in a refuge, or to give the kind of colourful Body Shop and Soap & Glory I still used to enjoy to a seven-year-old girl. There were Braintree Bamboo Socks, Ted Baker body sprays, several hundred nail varnishes, and all sorts of pieces of jewellery and toys. FLATLAY. AESTHETIC. EAT YOUR HEART OUT, SELFRIDGE HAMPERS. Face wipes and makeup remover (I cannot overstate how desirable these became, I haven’t searched for anything so assiduously since Beanie Baby-collecting in the late 1990s). Shampoo/conditioner in sizes of 350 ml or less (larger ones make the boxes very heavy, take up room, and are difficult to store. Bigger ones already donated will go to other charities). There were, conversely, VAST amounts of body lotion, moisturiser, hand cream, nail varnish, and soap. For safety reasons which require little imagination, charities ask people to avoid giving sharp or glass items, e.g. mirrors, tweezers, reading glasses, razors, or scissors. They also have to refuse alcohol, or items with sexual imagery on the packaging. Cosmetics are hugely popular, but avoid foundation, concealer, or other products which depend on the lady in question being a certain skin colour (Project Shoebox Oxford will put together a grab bag, though, for refuge residents to sift through themselves, but it’s not a shoebox item per se). It should go without saying (AND YET), but used/opened products are no good at all, look at your life and your choices if you think otherwise. Glittery/messy/unwrapped products can also wreak havoc. Many thanks to my lovely colleague Catherine Redford, whose support of Project Shoebox first alerted me to said project’s existence. If you can’t make it to a party, but would like to support Project Shoebox Oxford, you can donate money online here. I hope that everyone who receives a box is helped and pleased by it, and that all the recipients are in their own homes, facing much brighter futures, by this time next year. Straight, white, cisgendered, non-disabled Christian man in officially Christian country resigns from public office citing persecution/suspicion* while poor people literally burn to death in tower block. This has nothing to do with Jesus and everything to do with homophobia. Few people mind your Jesus (well, I mind your Jesus, but not Jesus per se, I’m a Christian after all). A lot of people mind your evasive reptilian bigotry. Again: straight white Christian man resigns on grounds of persecution while poor people literally burn to death in tower block, and yet the failure of one homophobe to achieve his desired public office (Theresa May & the DUP indicate that other frothing bigots manage, Tim, maybe the problem is you?) is what should really be shaming our society. 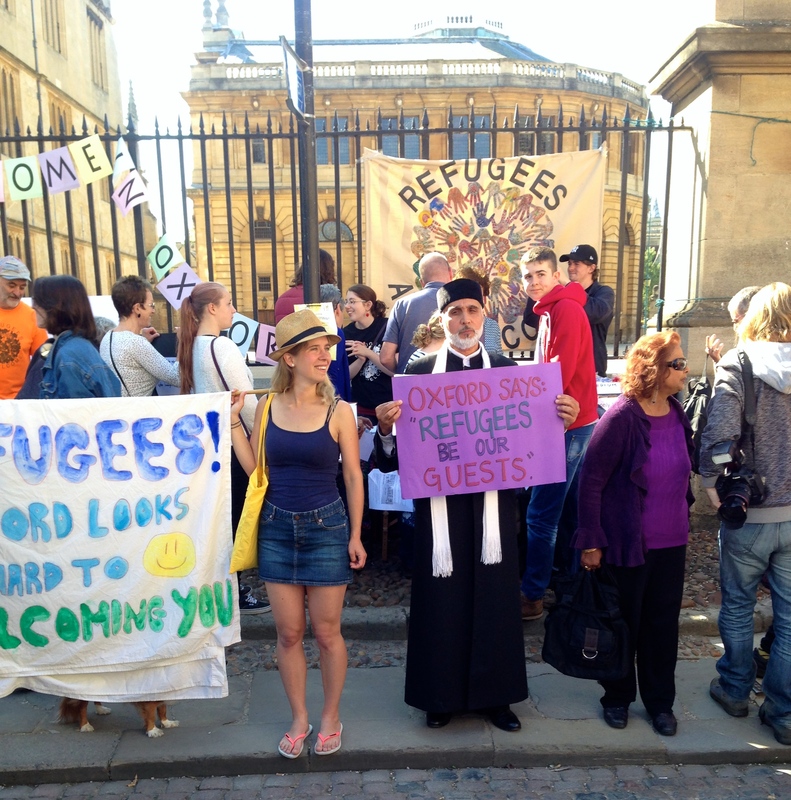 Oxford: Refugees Are Welcome Here! 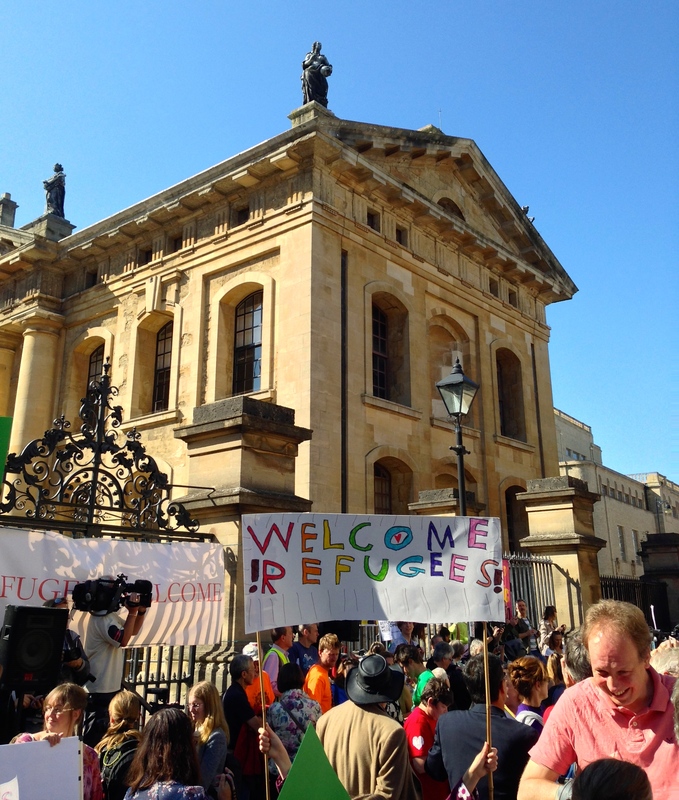 This afternoon, about 2,000 people gathered by Oxford University’s Sheldonian building for a peaceful demonstration in support of the Syrian refugees, showing that refugees are welcome in Oxford. The demonstration was chaired by Mark Lynas. A speaker from Oxfam, Dr Hojjat Ramzy of the Oxford Islamic Information Centre, Asylum Welcome, Emmaus Oxford and other charities spoke, as well as current and former asylum seekers from Syria, Eritrea and Afghanistan. The head of Oxford City Council confirmed that Oxford would be welcoming refugee families, and called on the government to make funds available to expedite the process. A speaker from UNISON called attention to the need to force the government to build more houses and abandon the racist policies which all parties espoused in the run-up to the last general election, before publicising the national day of action next Saturday. The author Mark Haddon called on Britain to “be more German”, after crowds in Munich applauded refugees arriving at their railway station. ACCOMMODATION, either as a host to Syrian refugees or as a foster parent to unaccom panied refugee children. A representative from the charity Homes For Good spoke about how his organisation is enabling people to become foster parents to Syrian refugee children who will shortly arrive in this country. For more information, go here. If you could offer a spare bedroom to an adult refugee or a refugee family, Oxford City of Sanctuary wants to hear from you. MONEY. Donating goods is excellent but, like all the major charities campaigning for financial aid (MSF | Red Cross | Save The Children | Oxfam etc. ), Emmaus Oxford is requesting cash donations so they can bulk-buy goods to take to Calais at the end of this month. Asylum Welcome, who run all kinds of schemes in Oxford from English lessons to youth clubs, are also desperately in need of funds. SKILLS. If you can teach English or translate, both the Oxford Syrian Refugee Helpline and Oxfordshire’s Asylum Welcome need your help. It seems to me that every other Oxford resident has a TEFL certificate mouldering or sparkling away in their CV – stronger English language skills make negotiating life as a refugee in the UK easier and less daunting, helping families integrate and access the resources they need. Could you give a couple of free lessons a week?